Tweeting an article from Daily Wire about Hogg’s college prospects, Ingraham appeared to make light of his rejections, saying it was “totally predictable given acceptance rates” that he was “Dinged by UCLA with a 4.1 GPA.” In the tweet, Ingraham also said Hogg whined about being rejected. He also tweeted calling on his followers to boycott Ingraham’s advertisers. “Pick a number 1-12 contact the company next to that #,” he tweeted. And it seems that his calls for Boycott works! At least 10 sponsors have pulled their support from “The Ingraham Angle” after the host mocked Parkland, Fla., school shooting survivor David Hogg over his college rejections. 1.Rachael Ray’s pet food brand Nutrish is removing its ads from Laura Ingraham’s show after the Fox News host posted a critical tweet about a Parkland, Fla., high school student. 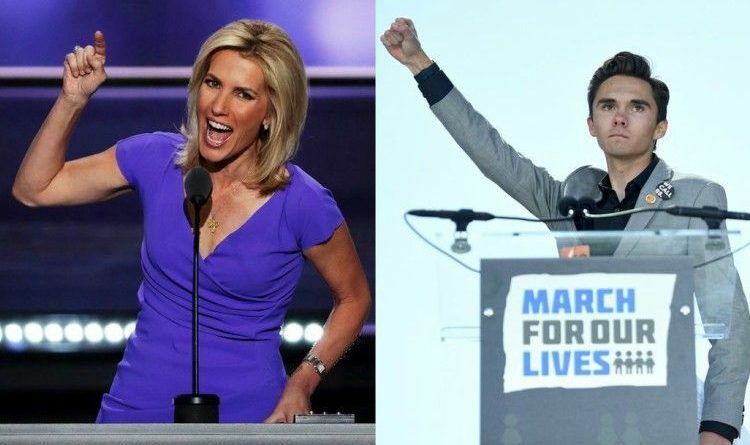 “We are in the process of removing our ads from Laura Ingraham’s program,” Nutrish, a dog- and cat-food company, tweeted in response to a tweet from the student, David Hogg, who called out Ingraham’s top advertisers after she mocked his reported rejection from several colleges. 2.We will continue to monitor where our advertisements appear on the open market to ensure they fit our guidelines,” TripAdvisor’s spokesperson said. 3.Later on Thursday, online home goods company, Wayfair told CNBC that it plans to stop advertising on Ingraham’s program over the tweet. 4.The Atlantis, Paradise Island resort said Friday that it would be pulling its advertisements from Fox News host Laura Ingraham’s show over her comments about a Parkland, Fla., high school shooting survivor. “Atlantis does not support or agree with the recent comments made by television broadcaster Laura Ingraham,” a spokesperson for the Bahamas resort said in a statement to The Hill. “Although we are an organization that believes in freedom of expression, we do not condone discrimination, bullying, mockery or harmful behavior of any kind. As a result of these events, we have decided to remove all brand advertising tied to the program,” the statement read. 5. Hulu has joined the companies pulling their advertisements from Fox News host Laura Ingraham’s primetime program after she mocked a student survivor of the Parkland, Fla., high school shooting over his college rejections. “We’d like to confirm that we are no longer advertising on Laura Ingraham’s show and are monitoring all of our ad placements carefully,” the streaming service said in a tweet Thursday. 7.Earlier, candy maker Nestle also said it would stop advertising on Ingraham’s show. “We have no plans to buy ads on the show in the future,” a company spokesperson told CNBC. 8. Expedia. The company told CNBC it had “recently pulled the advertising” from the show, but did not specify timing or whether their actions were a result of her comments towards Hogg. The clothing box subscription service has also confirmed it will be pulling all ads. 10.Weight loss and nutrition company Jenny Craig said Friday it would stop advertising on Fox News host Laura Ingraham’s show. “We have decided to take steps to discontinue advertising on this show,” Jenny Craig. The other companies listed in Hogg’s tweet did not immediately respond on whether they will decide to remove their ads from her show! Maybe we should push back and boycott these companies! Share this and lets boycott them!